Biggest strength in 2016: Only allowing 21.6 points per game, the Colonials defense certainly kept them in games last season. Robert Morris also got an eye-popping 85 tackles for loss last season, showing that the defense was doing their job. That’s the foundation for this year’s team as well. Biggest Challenge In 2016: Behind true freshman QB Matt Barr (5 TD passes/13 INTs), Robert Morris really struggled on offense. They only averaged a little more than 14 points per game, and only scored 10 points during the 3rd quarter all season. That trend will have to be reversed in order to see improvement this season. Biggest Departures: LB Jake Tkach (93 tackles, 4 tackles for loss) was the meat and potatoes guy on Robert Morris’ tough defense, one of the Colonials’ few upperclassmen last year, while DE Forrest Mason (11 1/2 tackles for loss, 6 1/2 sacks) provided a lot of RMU’s pass pressure as well. These two key guys will be hard to replace. Players To Watch: Banaszack has made it a priority to recruit western Pennsylvania and the WPIAL, and they have a trio of localplayers that have Colonial fans very excited: RB Harrison Dreher, WR Tim Vecchio, and WR/S Trey Earl-Edwards. They’ll be given every opportunity to seize the moment, and should be thrown in the mix quickly, and along with WR Trey Buss, form the nucleus of a team that could improve quickly on offense. Biggest Game: at Liberty, 10/1/2016. The Colonials have a fascinating out-of-conference schedule, with two home games vs. sub-D-I opponents, an away game vs. perennial PFL contenders Dayton, and a stretch game vs. Youngstown State, conferencemate of North Dakota State. But it’s this game against Big South Conference title contenders Liberty that will determine how far the Colonials can go in 2016 – a win, or even a strong performance against a team with one of the best home atmospheres in FCS, would go a long way towards a successful season. Rose-Colored Glasses Say: The young team who struggled during stretches in 2015 can emerge from their out-of-conference schedule with a big upset – and that momentum will drive them towards 2016 success. 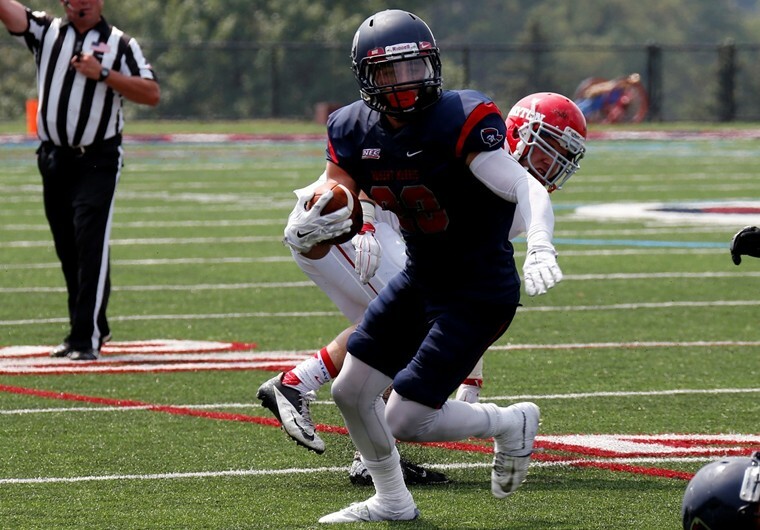 Glass Half Empty Says: This still-young Colonials team will stuggle against three FCS playoff contenders, all on the road, and do they have the maturity, even, to take care of the sub-D-I teams at home? They’ll struggle out-of-conference with one or two wins, and will have to learn how to win in conference play. Robert Morris In Two Sentences: Coach Banaszak’s priority of recruiting the WPIAL seems extremely wise, and long-term, seems like an excellent course of action. But it feels like the Colonials might struggle this year as he molds the team in his own image.